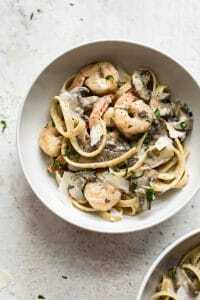 This shrimp and mushroom pasta is a fast, easy, and flavorful! This pasta dish is simple enough for a weekday and elegant enough for company. This recipe first appeared on The Recipe Critic (I am now doing monthly guest posts over there!). Prep your shrimp. Ensure they’re thawed first (run under cool water) if you’re using frozen shrimp. Peel them and remove the tails. Meanwhile, boil the pasta water. Cook the mushrooms. Add the butter and oil to a skillet over medium-high heat. Once the pan is hot, sauté the mushrooms until the water is cooked off (about 5-6 minutes). Take the mushrooms out of the pan once they’re done. Make the sauce. Take the skillet off the heat and add the garlic, mustard, flour, lemon juice, Italian seasoning, and chicken broth. Return the pan to the heat and let it cook for about a minute, ensuring you’ve stirred the mixture well. You then add the cream and let it simmer for a couple of minutes. Finish cooking the dish. Add the shrimp and mushrooms back to the pan. Cook for another 5 minutes or until the shrimp are cooked through and the sauce has thickened up a bit. Toss with the pasta and add a little pasta water if you want to thin the sauce out a bit. Pro tip: My trick to making creamy pastas taste extra delicious is using a little bit of Dijon mustard. It adds that extra special something to the sauce. If you don’t have any on hand, you could leave it out, but I do love including it in many of my recipes so I always keep a jar in the fridge. I used cremini mushrooms, but white mushrooms or whatever mushroom you have on hand will work too. I used 31-40/pound count frozen raw shrimp. Feel free to use smaller or larger shrimp or fresh shrimp. Can I substitute something else for the cream? I don’t recommend it. You could try half-and-half, but the sauce will end up thinner. 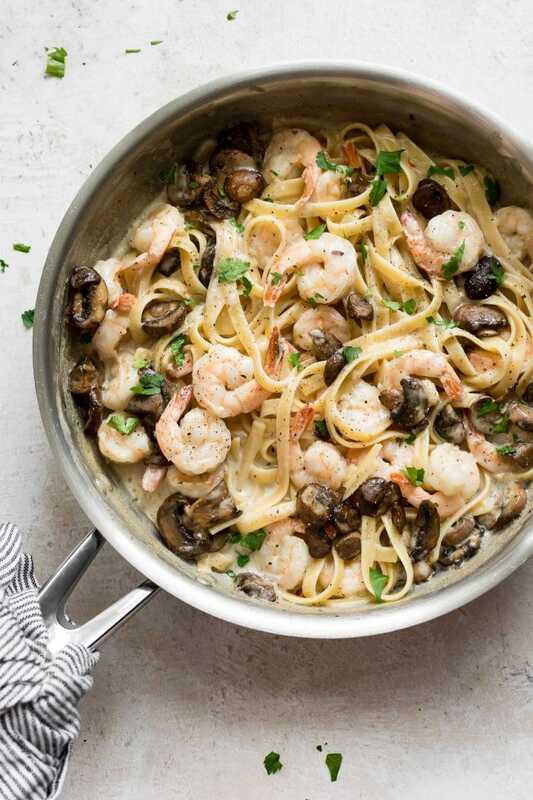 Love shrimp pasta? 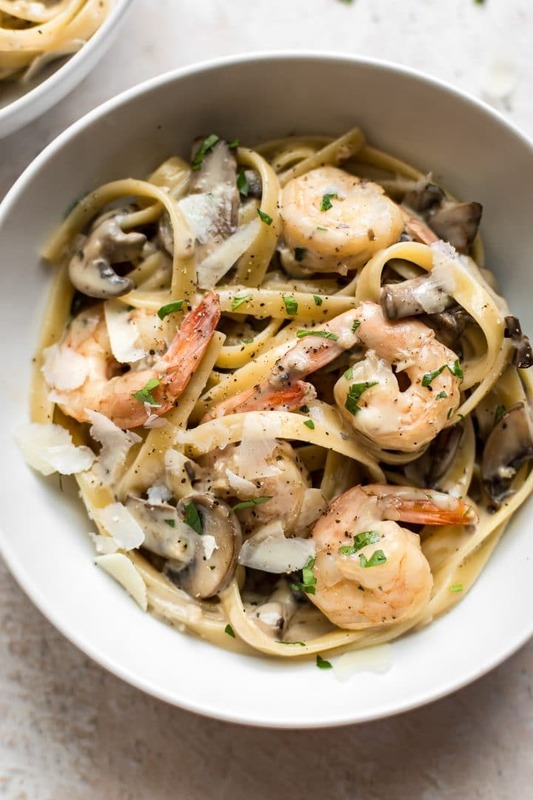 You may also like my Cajun shrimp pasta, my creamy lemon shrimp pasta or my shrimp and bacon pasta. 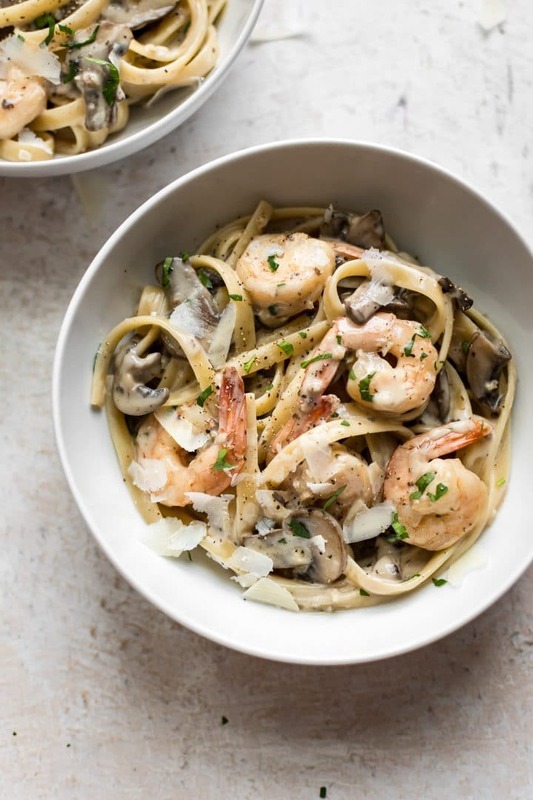 I hope you will enjoy this shrimp and mushroom recipe! 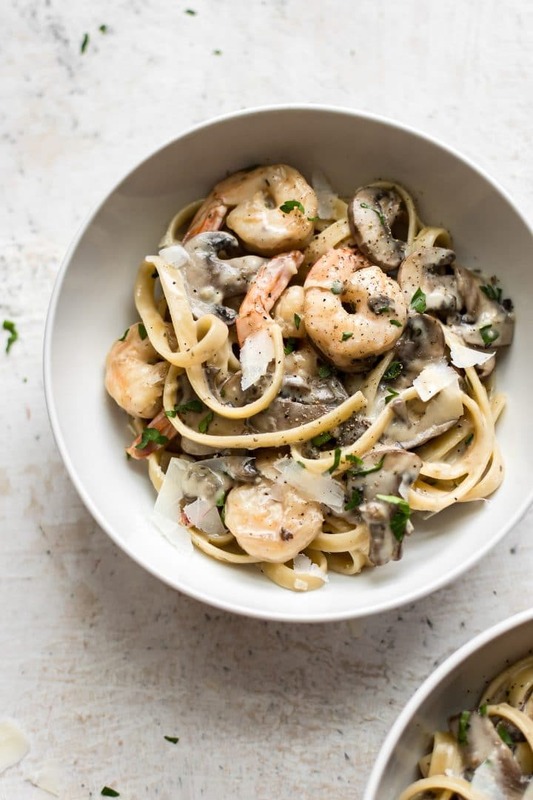 This shrimp and mushroom pasta is a fast, easy, and delicious! This pasta dish is simple enough for a weekday and elegant enough for company. Boil a large, salted pot of water for the pasta. Cook pasta al dente according to package instructions. Add the butter and oil to a skillet over medium-high heat. Once it's hot, add the mushrooms and cook for 5-6 minutes or until the mushrooms release their water and it's cooked off. Take the mushrooms out of the pan and set them aside. Take the pan off the heat. Add the garlic, Dijon mustard, flour, lemon juice, Italian seasoning, and chicken broth to the pan. Return the pan to the heat. Stir until the mixture is nice and smooth, and let it bubble for a minute or so. Add in the cream and let it simmer for a couple of minutes. Add the shrimp and mushrooms to the pan. Cook for 5 minutes or until the shrimp are cooked through and the sauce is thickened to your liking. Taste and season with salt & pepper as needed. Drain the pasta and toss it with the sauce (add a little pasta water if you wish). Serve with plenty of freshly grated parmesan. Anything from 3/4 lb. to 1 lb. of shrimp will work fine. Tried this recipe tonight, and it is quite delicious. I do agree that the dijon mustard adds another level of flavor to this dish.